This smaller version of the Original EZ Leaf Hauler can hold 4 times more than a wheelbarrow. It serves as a dustpan of sorts for your yard, transporting leaves and debris from your yard with ease. The two included stakes secure the Sport EZ Leaf Hauler to the ground even in windy conditions. The surface area totals 24 square feet. Three of the four sides have sturdy barriers to keep your debris on the hauler. The four built-in handles make it easy to haul away leaves and debris with no lifting. 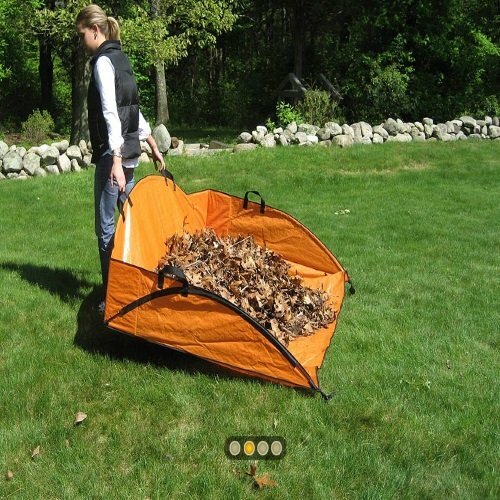 Made of a durable woven tarp material, the Sport EZ Leaf Hauler is maintenance free and folds up compactly for storage. You may also love the Grab X Leaf Grabber. Just pick up your leaves and put them right in the EZ Leaf Hauler.